Every Saturday in the Weekend section of the National Post is a series called " Gastropost" - Food Missions for Food Lovers. Each week, a food mission is assigned. Complete the mission, submit your post with a photo and you could be featured in the following week's Gastropost page. So I signed up in August and completed my first mission - Food on a Stick. 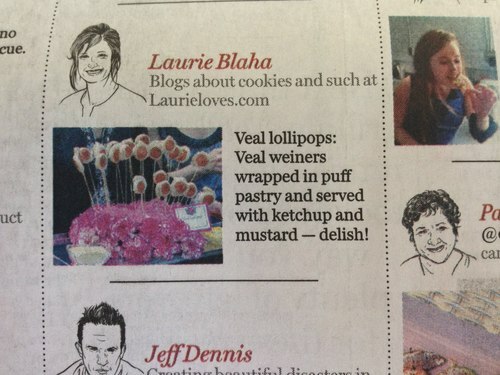 I submitted my Veal Lollipops, a party favourite. And my first post was selected and was printed in the paper. They even did a caricature of my photo. You can see my page here. Some missions are more appealing than others but if you love food, sign up here. I will be watching for your Gastropost.